Varro [1st c. BCE] informs us, on his own authority, that the wool on the distaff and spindle of Tanaquil [wife of Tarquinius Priscus, 5th king of Rome] (who was also called Gaia Caecilia) was still preserved in the temple of Sancus; and also in the shrine of Fortune a pleated royal robe made by her, which had been worn by Servius Tullius [6th king of Rome]. Hence arose the practice that maidens at their marriage were accompanied by a decorated distaff and a spindle with thread. 3. Catullus (1st c. BCE) 61.114-128. Translated by Peter Green. see the flame-coloured veil approach! hand out nuts to the children! boy toy, scatter your nuts now! 3a. Catullus (1st c. BCE) 64.1-7. Translated by Peter Green. sweeping blue, deep-sea vistas with their blades of fir-wood. 3b. 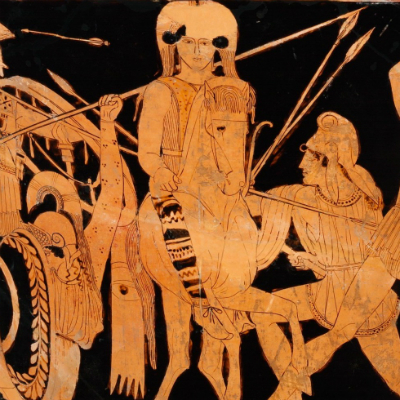 (Close up of) Athenian red-figure volute krater (late 5th/early 4th c. BCE). Name vase of the Talos Painter. Discovered at Ruvo, Italy. Image: Furtwängler and Reichhold. The Argonauts on the Argo (left). Medea (right). Talos is a metal giant that Medea defeats for the Argonauts (see: Apollonius Rhodius‘ Argonautica 4.1638–93). 4. Catullus (1st c. BCE) 64.12-21. Translated by Peter Green. deepwater Nereïds, in wonder at this portent. then that the Father himself felt that Peleus and Thetis should wed.
5. Catullus (1st c. BCE) 64.31-35; 46-51. Translated by Peter Green. its purple drapery dipped in the mollusc’s blushing dye. portrays in marvelous art the brave deeds of heroes. 6a. Catullus (1st c. BCE) 64.52-65. Translated by Peter Green. the shallows, scattering broken promises galewards. 6b. Roman wall painting. Ariadne weeps as Theseus sails away. House of Meleager, Pompeii (Napes Inv. 9051). Image: wikimedia. 6c. The Roman statue known as “Sleeping Ariadne” from the Vatican Museum. Because the statue has a bracelet in the form of a serpent, it was long believed to be of Cleopatra. Ennio Quirino Visconti identified it as Ariadne in late 1700s. Image: Vatican Museum. 7a. Catullus (1st c. BCE) 64.110-115. Translated by Peter Green. its deceptively mazed confusion should frustrate his purpose. 7b. Elaine Reichek (2009) Ariadne’s Lament. Image: MFA Boston. 7c. Elaine Reichek (2011) “The Graces With Their Own Hands.” Hand embroidery with beads on linen. Remix of Giovanni Battista Crosato’s (18th c.) “Bacchus crowning Ariadne with a diadem of stars” and Apollonius of Rhodes (Argonautica 4.423-435). Image: elainereichek.com. 8a. Catullus (1st c. BCE) 64.303-327. Translated by Peter Green. the trio of Fates [Parcae] began their prophetic chanting. were stored in little baskets of woven osier. a song no future age would accuse of falsehood. run, drawing the weft out, run, you spindles!